Back in February I asked readers of this blog who they thought would run for Liberal leader, and who they'd consider voting for. Admittedly, this is as far from a scientific poll as you'll ever get, and I won't pretend that the 500+ voters in this straw poll are all Liberals. 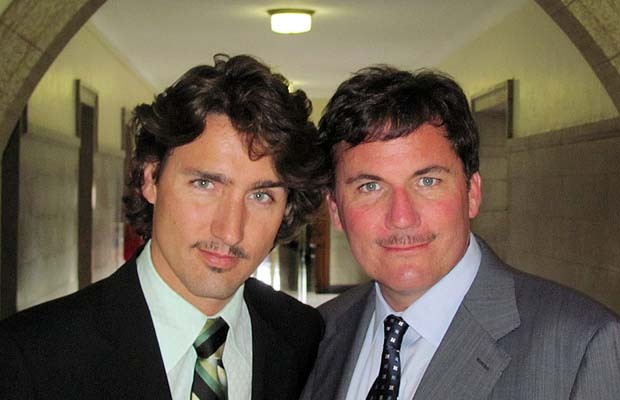 But we're not going to see anything resembling a credible Liberal leadership poll for close to a year, so let's have a little fun with what we've got. Before that, one other thing. It looks like a group of Borys Wrzesnewskyj supporters swarmed the poll late, so I've excluded Borys from my recap below. Mind you, the fact that he appears to be the only candidate with supporters dedicated enough to freep a web poll at this stage should likely tell you there are people out there who would like him to run. Which is more than can be said for a lot of the names I floated. Rae is seen as the most likely to run and has the largest support base, which tells you all the talk about him being the frontrunner isn't misplaced. 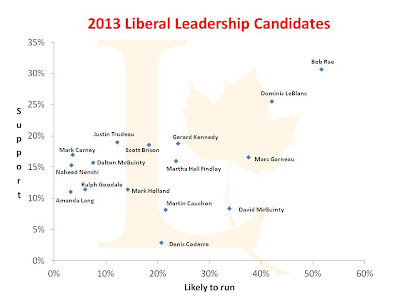 My man from 2008, Dominic LeBlanc, is the only candidate within striking distance of Rae on the support poll, though 11 other names earned between 11% and 19% so there are plenty of viable candidates out there. I've plotted the 16 candidates who scored at least 10% on either poll below. 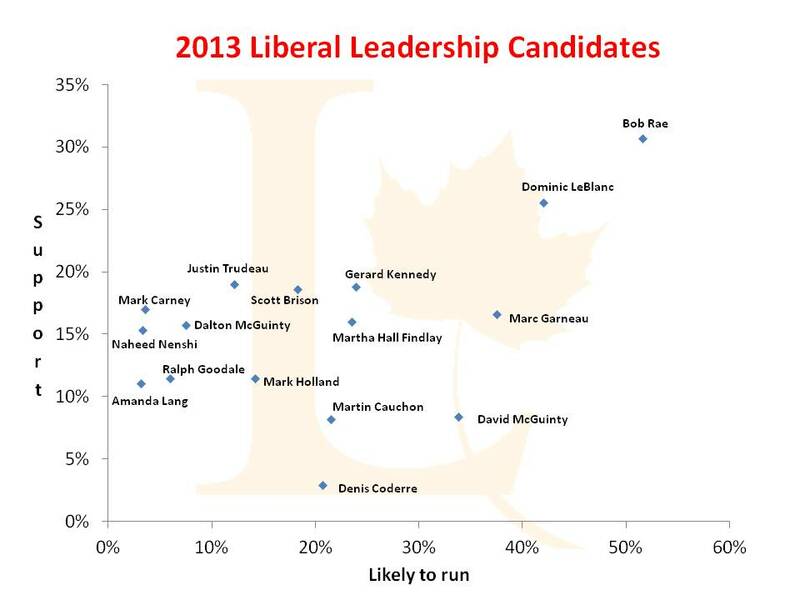 You can see that Trudeau, Carney, Dalton, Nenshi, Goodale, and Lang all have more people who like them than than expect them to run, leaving them as the most probable candidates for a genuine "Draft" movement. None of this means a heck of a lot when we don't even have the rules yet. But it shows there's nothing even remotely resembling a consensus on who will be running, never mind who will win. Tomorrow, I'll speculate a bit about who might be running, so if you're hearing any rumours, by all means float names my way. I know it's just a web poll, but I was surprised to see Bob Rae as the candidate with the most support. From what I've read online, it seems like a lot of Liberals take issue with him for his age, broken promise, and NDP record, but he's miles ahead of the field. By Deb, at 10:00 a.m. I don't really understand why Bob Rae is a frontrunner at this point. By Jordan, at 10:24 a.m. Throwing out a name that I haven't seen mentioned. Correct me if I'm wrong but the issue with this guy would be his French as I'm not sure he speaks. However his french sounding last name may suffice. By icky, at 12:36 p.m.
Sandra Pupatello could be a good candidate. David Betschi also sounds like a good candidate, hopefully his campaign gains momentum. By Jordan, at 12:58 p.m.
Rae is continuing to court a number of constituencies inside and outside the traditional Liberal Party, which is in line with what this poll suggests. By hazzard, at 10:24 p.m.
Anon - Rae, Findlay and Kennedy are the only veterans from past campaigns I expect to run, and Findlay is the only one still with debts, though I expect she will pay those off shortly (she actually may have already). By calgarygrit, at 10:39 p.m.
By margahayuland, at 7:58 p.m.
By Anonymous, at 5:44 a.m. It sounds good to read about race. In this technology oriented era, you can get essay writing service for completing your reports, papers and documents within deadlines. By Eileen Archer, at 5:21 a.m.
By Kimberly McNeeley, at 1:47 p.m.
By Hafiz Sajid, at 11:31 a.m.
By Riya Jacob, at 7:45 a.m.
By Larry Morales, at 4:46 a.m.
great insight about polling...thanks for sharing with us!! By Rabale@ TESOL certified, at 4:30 a.m.
Hello! A lot of students have problems with writing essay. I think, it maybe difficault to write a good essay for students who have to work part time or students from abroad. So, they propose essay-mania.com a high-quality writing help! By Karolin, at 4:47 a.m.
By Rory, at 4:26 a.m.
By Mabel King, at 11:22 a.m.
Good information! Don't forget to visit good writing service as custom term papers and order essay here! By Loren Hill, at 7:57 a.m. I suspect that Quebecers are seriously under represented on this poll. It mainly speculate a bit about running. It also means a heck of a lot when we don't even have the rules yet. academic essay writing services helps to know more about academic writing. By Katherine Hayden, at 5:28 a.m.
By Lisa.M. Henry, at 11:47 p.m.
By Giải Trí Tổng Hợp, at 11:05 p.m. Being a great and successful leader is not an easy task. One has to be very qualified, talented, patient and a good listener. If someone has no idea how to write an effective and rich in content essay or research paper, I recommend to visit http://www.grand-essays.com/, a team of professional writers that are always ready to give you premium assistance. By Brenda Thomson, at 7:45 a.m.
By buyket, at 11:00 a.m.
By Flowers Next, at 5:39 a.m.
By Alice Taylor, at 3:19 a.m. I like your all post. You have done really good work. Thank you for the information you provide, it helped me a lot. I hope to have many more entries or so from you. I like play game: redball4games.com. What about you? By Thu Lê, at 11:40 p.m.
By ngocanhng, at 3:29 a.m.
Bob Rae is a person with good personality and have a good skill to lead a public as a leader. The essay writing service is the top most online writing service provider. By leonae gonzales, at 6:52 a.m.
By Anonymous, at 9:41 p.m.
By amta khan, at 4:23 a.m.
By elton brown, at 2:02 a.m.
By Judyjen, at 11:46 p.m.
By Edna vail, at 11:17 p.m.
By Faisal Ahmed, at 3:43 a.m.
By hitesh yadav, at 8:15 p.m.
By Lassoart SEO, at 12:26 a.m.
By vipan kumar, at 8:26 a.m.
By مروة محمد, at 9:50 a.m.
By reda gamal, at 8:31 a.m.
By reda gamal, at 8:34 a.m.
You need to install the official Instant Articles plugin where Facebook will configure some things. You will need a Facebook page for your WordPress, a Facebook app, and at least 10 articles to begin with. You have to visit Facebook Instant Articles website to sign up and claim your URL to prove ownership of your website. After that, add WordPress Instant Articles RSS feed for your website by installing and activating the Instant Articles for WordPress plugin. By Naman Modi, at 7:35 a.m.
By Gangaspa, at 12:37 p.m.
By Stjsrty Xtjsrty, at 10:44 p.m.
By saluja anand, at 4:59 a.m.
By Fikri Ferdiansyah, at 2:41 a.m.
By situs poker terbaik, at 9:48 p.m.
By Marion T. Ramirez, at 11:38 p.m.
By SEBA BD, at 12:37 p.m.
By Writing expert, at 1:46 p.m.
By Tristar Traders, at 4:07 a.m.
By Serafim Rostiw, at 5:32 a.m.
By Obat Penurun Kolesterol Tinggi, at 8:06 a.m.
By Saadat Abbas, at 12:17 a.m.
By Robinwely, at 5:03 p.m.
By 800 Toll free number, at 5:14 a.m. This is the largest part useful contribution to the discussion. While using the products of Brother Printer, it can happen that the users might face some kind of issue in the working of the products and there are lots of issues getting, then you can contact us via Brother Printer customer Services phone number. By Technical Team, at 5:45 a.m.
By visiting our website, you will find proper steps that would help you in the process of solving all the issues related to Adobe Flash via Adobe Photoshop support number. By Adobe Resolution, at 12:35 a.m.
By jon blly, at 4:03 a.m. There are times when a user might face some kind of issue in the working of the product and to get complete solutions, a user must connect with the experts through Avira Antivirus Customer Service Phone Number. By Technical Team, at 2:24 a.m.
By Alishia Sergi, at 2:15 p.m.
By Sharon Wood, at 1:18 a.m.
By Alan Blake, at 7:00 a.m.
Hi thanks for the lovely post. It is very informative.Eset Nod32 is the best free antivirus program. Users sometimes get unwanted error while using this software. Get instant solution with Eset Nod32 antivirus customer service phone number. By 800 Toll free number, at 1:10 a.m.
By Dale Morris, at 1:23 a.m.
By Saadat Abbas, at 7:13 a.m.
By Saadat Abbas, at 7:15 a.m.
By Sophia, at 12:59 a.m.
By Aulia, at 4:53 a.m.